Multnomah Falls is the second highest year-round waterfall in the United States and is located in the Columbia River Gorge National Scenic Area, approximately 30 miles east of Portland. The falls attract approximately two million visitors each year. Due to the popularity of the falls, especially during the summer months, demand often exceeds available parking at the two primary parking lots. One of these parking lots is located in a center median of Interstate 84. When this parking lot approaches capacity, queueing can occur along the I-84 eastbound exit ramp (entrance to the parking lot). This queueing has led to several incidents and has required ODOT maintenance crews to manually close the exit ramp under these conditions. The safety concerns associated with this parking issue have led ODOT to develop an automated parking system for Multnomah Falls, capable of detecting lot occupancy thresholds, notifying travelers of lot closure, and barricading the off-ramp. 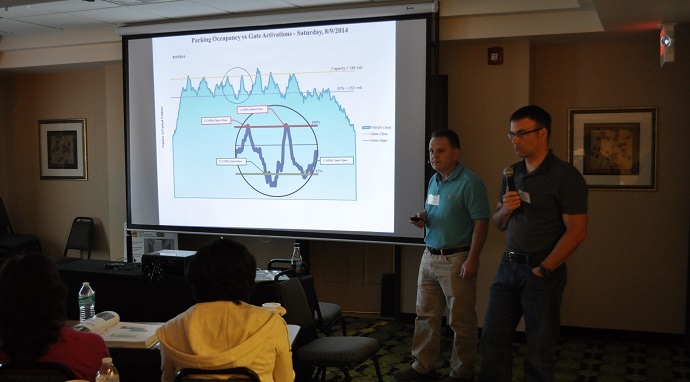 Dennis Mitchell and Doug Spencer, Oregon DOT ITS Engineers, discussed the design of the system including signage, detection, gate systems, ITS hardware and software, and the operational observations (as well as resulting improvements) of the system made to date. 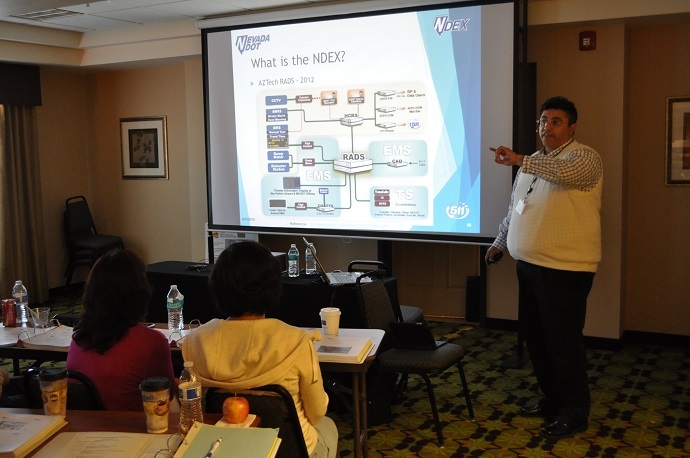 Israel Lopez from Nevada DOT’s Traffic Operations Technology Section presented the Nevada Data Exchange (NDEX). The NDEX uses the Traffic Management Data Dictionary (TMDD) standard to create a data exchange to aggregate the States’ data, create a data archive for historical data queries, and create an effective visualization dashboard to display current metrics / key performance indicators (KPIs). Mr. Lopez explained the problem and need for the project along with the resulting technical needs and requirements. He also described the purpose and functionality of the NDEX in relation to various NDOT data sources such as RWIS, CCTV, DMS, and HAR, and discussed the soon to be released data visualization module. In an effort to improve information management during weather events and post road conditions more quickly on the WYOROAD website, Wyoming DOT developed a tablet reporting app for use by maintenance personnel (i.e., snow plows, foreman trucks). At the same time, WYDOT also installed WiFi hotspots at various locations to complement Wyoming’s statewide low speed “P25 data” communications network. Prior to this system, plow drivers across the state reported road conditions and incidents, and requested speed limit (VSL) and Dynamic Message Sign (DMS) changes, pace speeds, and wind speeds via radio from the WYDOT Transportation Management Center (TMC) dispatcher. The dispatcher would then record/give requested information, transfer information to Wyoming Highway Patrol (WHP) and then the information could be posted to the web site and other information systems for the public. The in-vehicle app and Wi-Fi system significantly streamlines the gathering of information from WYDOT personnel and posting to the WYOROAD website, improves timeliness and accuracy of condition reports, and provides more information to maintenance personnel. 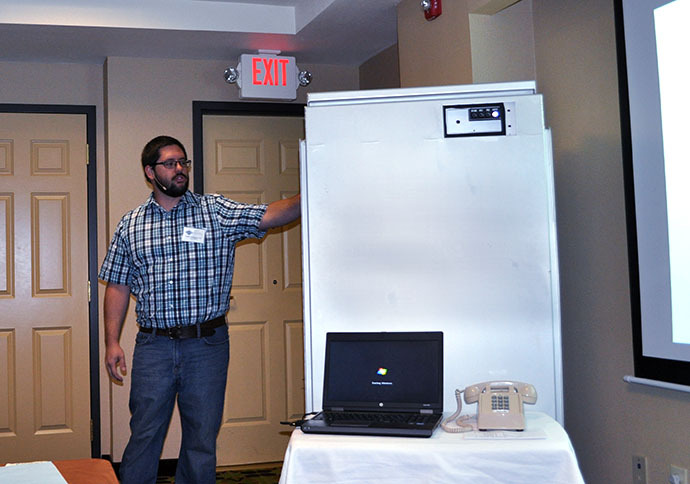 Mark Kelly, Communications Systems Supervisor for WYDOT, explained the need and goals for the tablet app and reviewed its development. He discussed the functionality of the app and then gave a live demonstration of the system. Mr. Kelly also discussed the WyoLink P25 radio system and the new WiFi installations that the tablet uses to communicate with the TMC. Faced with the need for hundreds more variable message signs (VMS), Caltrans considered advantages and disadvantages of different procurement options before choosing to develop and build its own advanced VMS. David Wells, Caltrans Senior Transportation Electrical Engineer and AVMS Project Manager, discussed the development of the AVMS specification, and the design, manufacturing, and testing of the new sign and its control software. He reviewed the various off-the-shelf components of the sign as well as the custom Pixel Matrix Modules, the Remote I/O Box, and the Test Box. Along with the design advantages of the new sign, Mr. Wells also described the features and benefits of the improved custom sign control software. The Caltrans AVMS is non-proprietary, has interchangeable parts between manufacturers, provides a color option, uses less power and a safer low voltage design, and has improved operating capabilities. 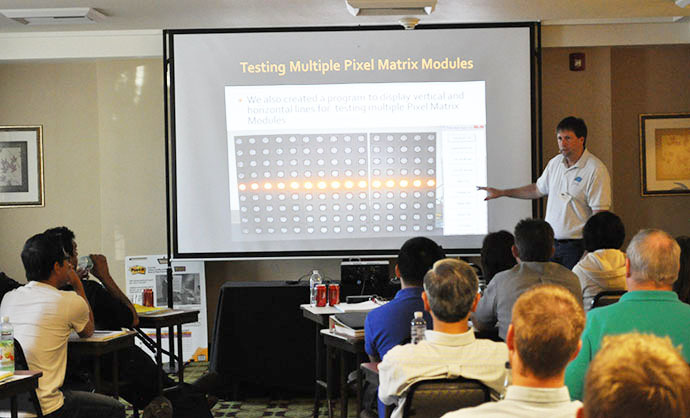 Mr. Wells demonstrated several of the Pixel Matrix Modules during breaks and networking sessions. 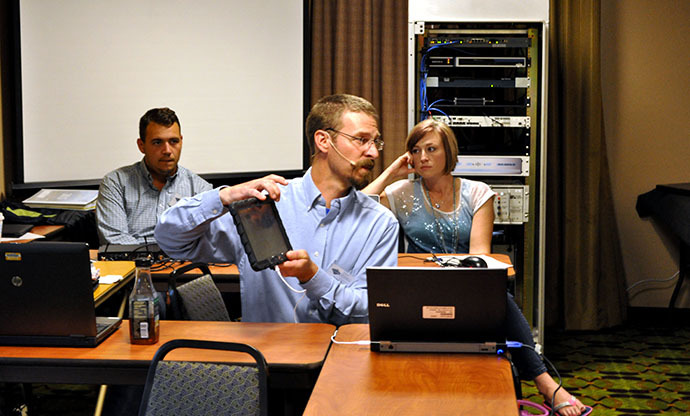 The Utah Citizen Reporter Program enlists trained volunteers to report road conditions along specific roadway segments across Utah. The long term goal of adding Citizen Reporters to UDOT’s weather operations road reporting is to supplement current condition reporting on segments where drivers are already traveling. Many of the segments selected for the program are critical rural routes where there is no infrastructure to install traffic cameras or an RWIS. The citizen reporters are intended to enhance UDOT’s coverage of road weather reporting on under-reported segments throughout the state of Utah. Citizen Reporters submit their observations through an industry-first reporting app. 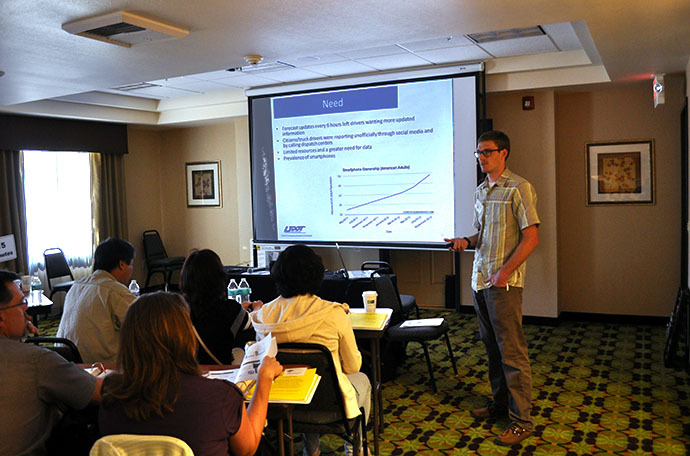 Corey Coulam, a program manager for the Utah Traffic Operations Center, presented the need for the program, the program’s goals, technical and ideological structure and integration with Utah’s traveler information system, and participation statistics. Winter operations can be dangerous due to low visibility, severe weather, and icy roadway conditions. This is further compounded when chain conditions exist and field maintenance workers are on foot near live traffic. This is the case along Interstate 5 in Yreka, California, where signs that display current chain conditions to the motoring public are routinely changed during storms. Traditionally, field maintenance workers must traverse the freeway several times whenever a chain control condition changes. This exposes workers to oncoming traffic in snowy and icy roadway conditions. ITS engineer Keith Koeppen, of Caltrans District 2, discussed and demonstrated the Safety Chain Control System that he and his project team developed to enhance worker safety in these conditions. The new system is semi-automated and allows field maintenance workers to activate the chain condition signs remotely from a cell phone or traffic cabinet. Mr. Koeppen explained the technical architecture of the system, described the system’s details, and discussed the deployment of the system and associated challenges. Note: PDF contains embedded video clips and is ~31 MB in size. Adobe Reader 9 or higher is needed to view these video clips. A version without embedded video (~4.2 MB) is available here. 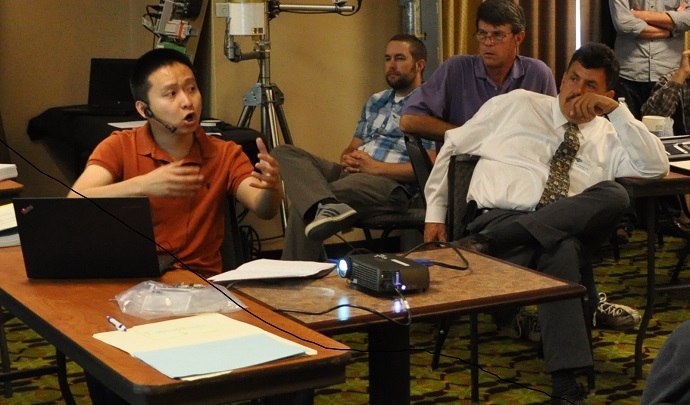 Martha Styer, a Senior Transportation Electrical Engineer for Caltrans Division of Traffic Operations, and Dr. Dali Wei, a post doc researcher at UC Davis and software developer for Trans Intelligence, presented and demonstrated the TranSync Mobile Tool. The tool was developed by Trans Intelligence to provide an easy to use app for signal timing diagnosis, traffic progression evaluation, traffic signal timing verification, and bandwidth optimization functions. Instead of using personnel observation of traffic, TranSync is a useful tool for signal operations engineers to verify and quantify signal timing improvements, in real-time. 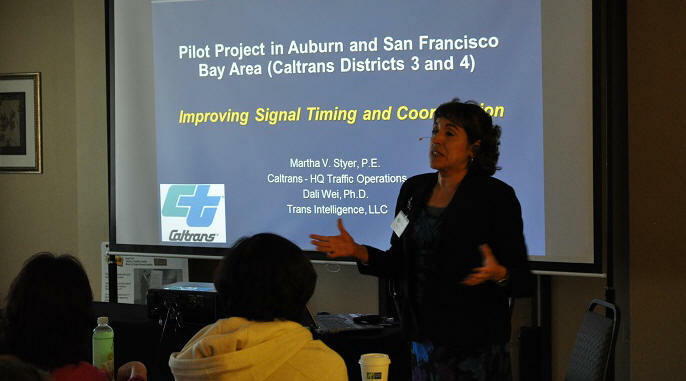 Ms. Styer reviewed the basics of signal timing and the current practices for optimization, as well as how the TranSync tool could improve upon the current techniques. Dr. Wei demonstrated the app and discussed the results of case studies completed in Auburn, Yuba City, and Mountain View, California. 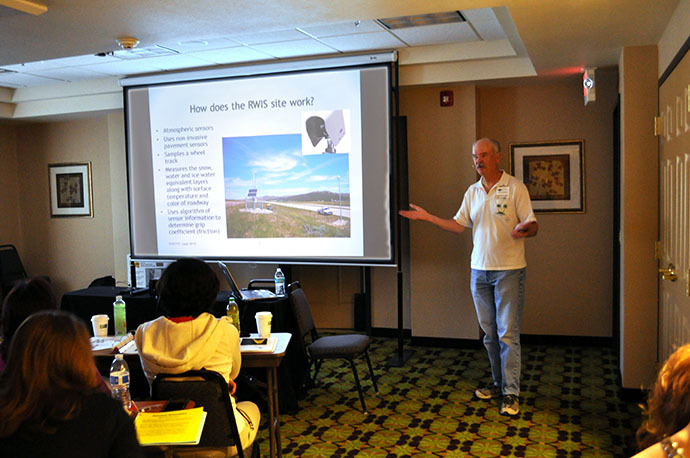 At the 2013 Forum, Dennis Jensen presented Idaho’s Winter Performance Measures program. Since that time significant development and research have taken place, and the program has evolved. This year, Bob Koeberlein, Headquarters Operations Engineer for the Idaho Transportation Department, provided an update on the Winter Performance Measures program and the latest results of the program’s implementation. He reviewed the concept behind the program, the transition from testing to full implementation, and growth of the system. Mr. Koeberlein explained the various calculations involved in the winter performance measures and discussed how the system has been implemented in terms of RWIS sensors and “scoring” algorithms to monitor the “grip” coefficient on Idaho’s roads during winter weather events. He also discussed the success of the program in regards to cost and operational benefits, lessons learned, and next steps for the program.